Resurgent political Islam, or astute Islamic parties? There were two main surprises in the 9 April legislative election in Indonesia, at least if the various quick count results are to be relied upon: the first was the poorer than expected performance of former president Megawati’s Indonesian Democratic Party of Struggle (PDI-P) and the second was the higher than predicted vote for Islamic parties. In 2009, the total vote for Islamic parties was 29%, the lowest ever recorded. All major pollsters had forecast an even worse result for the 2014 election, with the Islamic party-vote ranging from around 15% to 25%. No survey had Islamic parties improving on their overall performance of five years ago. But the quick count results from 9 April showed that the five Islamic parties contesting the election had gained about 31-32% of the national vote. Most of the polls had four of the five parties experiencing falling support; only the National Awakening Party (PKB) was slated to increase its vote. The quick count figures showed that in fact four of the five parties lifted their vote, and the Prosperous Justice Party (PKS), which had been predicted to suffer the biggest drop of all–around 3-5%–ended up with just a 1% decline. How are we to account for this unexpectedly good showing? To being with, there is little to suggest that this was due to a rise in ideological Islam. None of the four Islamic parties that passed the 3.5% parliamentary threshold campaigned using Islamic concepts or doctrines. Rather, their appeals to their core constituencies emphasised the practical benefits that they had or would deliver to their supporters. For example, PKB and the United Development Party (PPP), both of which have strong bases in the Islamic education system, promised to channel greater resources to Islamic schools and ulama (Islamic scholars). Likewise, the National Mandate Party (PAN) sought to win support from its Muhammadiyah constituency by casting itself as a defender of that organisation’s interests. Perhaps more significantly, when these parties were making their pitches to national audiences, their messages were invariably inclusive and universalistic, conveyed with the intention of having the broadest possible appeal in the electorate. Also, none of these four parties campaigned on sharia (Islamic law) agendas. The only party that did so was the Crescent-Star Party (PBB) that only gained about 1.5% of the vote and failed to clear the parliamentary threshold. The answer to why Islamic parties improved their position in this election lies not in some collective, across-the-board trend in the Islamic community but rather in the electoral strategies and campaigning of the individual parties. To understand their good showing we need to consider the parties one by one. The best performance of any Islamic party was recorded by PKB, which gained a quick count vote of around 9%, up from 4.9% in 2009. On this score, the polls were largely correct; most had predicted PKB would be the biggest Islamic party with approximately this level of support. At least four factors account for its improved showing. The most important of these is the party’s closeness to Nahdlatul Ulama, Indonesia’s largest Muslim organisation, which had facilitated PKB’s formation in 1998. In the 2004 and 2009 elections, relations between NU and PKB were frosty, but a concerted campaign by PKB chairman Muhaimin Iskandar over the past few years had presented the party as unequivocally serving the interests of NU. Increasingly state resources had been directed to NU via PKB, helping to earn the approval of senior NU figures. An indication of the shift in NU attitudes to PKB came with the decision of the NU chair, Said Agil Siraj, to appear in party advertisements with Muhaimin at the start of the campaign. PKB banners and advertising also prominently featured the NU symbol. The overall effect was to create in the minds of many NU members that PKB was ‘their’ party. Second, PKB had the best-funded campaign in its history, due in no small degree to the generous financial assistance provided by Lion Air’s Rusdi Kirana, who joined the party’s board just two months before the election. 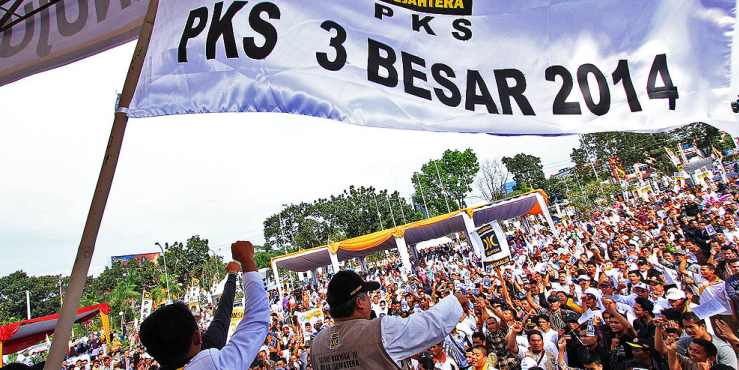 Third, PKB came into the election a relatively united and cohesive party, without any of the internecine rivalries and infighting that had marred its campaigns in 2004 and 2009. Muhaimin’s ability to entice back to PKB many of its previously disaffected cadre proved significant, especially in East Java, the party’s stronghold. Last of all, PKB rolled out popular performers Rhoma Irama and Ahmad Dani for its campaign. While these entertainers may not have directly attracted many votes to PKB, they did bring a sense of excitement and momentum to the party’s campaign. PAN’s vote of around 7.5% surprised both pundits and party leaders. Many surveys before the election had PAN languishing at 4-5% and one of the party’s own internal polls reportedly showed it struggling to rise above the threshold. But PAN campaigned well. It had a well-funded program of advertisements and mobilised its candidates and cadre to telling effect. Surveys showed higher voter recognition of PAN’s campaign than for other Islamic parties. In East and Central Java, where PAN has traditionally done well, close ties to local Muhammadiyah leaders also helped sway Muslim voters. PKS’ 6.9% quick count figure was the least anticipated of all Islamic party results. After several years of embarrassing corruption and morality scandals in the party, the most damaging of which saw its president jailed for 16 years in early 2014, the common view among political observers was that the party’s vote would sink to half or less of the near 8% that it received in 2009. The fact that it fell by only 1% is a remarkable feat by the party, particularly in containing the damaging fallout from the corruption cases. The corrupt PKS president was quickly replaced by indefatigable secretary-general, Anis Matta, who immediately began touring the country rallying disillusioned PKS cadre and reaching out to Muslim voters outside the party’s core constituency. During the campaign party cadre appreared highly committed and well organised, helped considerably in some areas by the incumbency of PKS governors, district heads and senior bureaucrats. Cleverly, the party sought to lessen the relative sins of its own corrupt leaders by establishing a twitter page called ‘KPK Watch’, which highlighted high-level graft in other parties. In the end, PKS’ 7% of the vote may not only reflect the loyalty and fervour of its own long-term members but also its success in attracting new members and sympathisers over the past five years to the party’s cause. PKS has the most effective outreach of any Islamic party and we may be witnessing the expansion of its core support base within the Muslim community. PPP, was the fourth-ranked Islamic party, receiving about 6.5% in the post-election quick count tallies. Few had expected it to do so well and most survey predicted the party would get between 4 to 5%. PPP has the least credible leadership of any Islamic party and its good performance would appear to have been due to several factors. First, PPP had success with the slogan that it was the ‘Great House of the Islamic Community’ (Rumah Besar Umat Islam), appealing to a sense that PPP accommodated all groups within Indonesia’s diverse Muslim society. Second, PPP made extensive use of the patronage opportunities that came through its two cabinet members, Religious Affairs Minister Suryadharma Ali and Public Housing Minister Djan Faridz. Both ministries poured vast sums of money into the Islamic education and social service system, ensuring the support of thousands of grateful local Islamic scholars and leaders. Last of all, although PPP avoided campaigning on Islamist issues such as sharia implementation and the banning of ‘deviant’ sects like the Shia and Ahmadiyah, it was nonetheless seen in many conservative parts of the electorate as the party which best captured their aspirations. So, Islamic parties may not be in terminal decline as many have predicted and they are likely to have a little more clout in the next government than they did in the previous one. But these results have been greeted more with relief than elation in Islamic parties and questions remain about their longer-term competitiveness, particularly if, as seems likely, the majority of observant Muslim voters continue to find mainstream non-Islamic parties such as Golkar and PDI-P more attractive than Islamic parties. This election result does not show a resurgence of political Islam but it does indicate its resilience and ability to adapt to changing attitudes in the electorate. The four Islamic parties that have gained parliamentary seats have done so partly because they have moved closer to the centre of the political spectrum, and away from a doctrinaire Islamic position. They are increasingly pragmatic, in keeping with the mood of the electorate. Their form of Islamic politics is not a religiously driven program of political action but rather an overlay of communal identity and sectoral interest. Dr Greg Fealy is Associate Professor at the Department of Political and Social Change at the Australian National University. His research focuses on Islamic politics and culture in Indonesia.